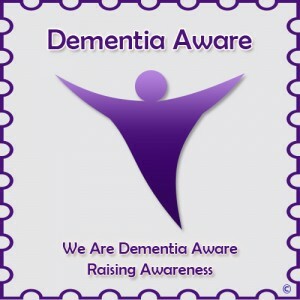 Dementia Awareness Week 2014 is this year Sun 18th May – Sat 24th May 2014. Some ‘symbols’, such as the ‘Purple Angels’, clearly offer much reassurance. I am genuinely interested in what ‘dementia awareness’ is. Raising awareness can mean different things to different people. It’s easy for me to overestimate what dementia awareness might be, as I have done my undergraduate finals, my Ph.D and my postdoc in brain conditions, and mainly dementia. I’ve never seen a Dementia Friends script. I’m mildly worried about whether the information in this script is accurate, but not any more than any other information from any other awareness publications. Having worked in two head offices of large medical charities, I am more than aware of the crap that is used for fundraising. But I do worry in case what you’re promoting is simply a source of income, and dwarfs entirely what the message is. The message here is raising awareness of all things dementia. We have to be very careful that befriending initiatives do not inadvertently end up belittling the whole issue of dementia. I don’t particularly mind if people wish to purchase ‘Friends for Dementia’ air fresheners (spoof). 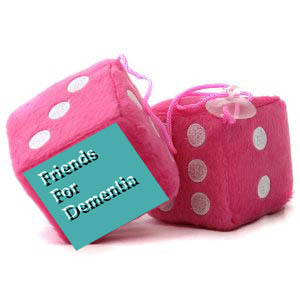 I don’t particularly mind if people wish to purchase ‘Friends for Dementia’ furry care dice (sic) (spoof), either. Some thought inevitably has to go into ‘raising awareness of what’? This is of course a laudable aim. But spotting symptoms of dementia in yourself may not be as easy as spotting a breast lump or a testicular lump (which admittedly can be difficult to spot). Some people living with dementia are unaware of their symptoms, a phenomenon known to clinicians as ‘anosognosia’. Raising awareness of the practical difficulties that Admiral Nurses have had in being commissioned? And the stories keep on coming of potential or actual actioned cuts of dementia services in the real world: such as this one in Devon, and one in Essex. I asked Kim Pennock, a prominent dementia campaigner in England, whether campaigners for dementia were concerned about cuts in social care. Meanwhile, the Alzheimer’s Society have introduced a scheme for accreditating ‘dementia friendliness’. It would be odd if the Alzheimer’s Society would be the sole arbiter of dementia friendliness. @alzheimerssoc @legalaware @SteveMilton1 http://t.co/W9UGekQmOX it just doesn’t sit right. AS the sole arbiters? I find this particularly perplexing as the Joseph Rowntree Foundation have done wonderful work on dementia friendly cities such as York. Also I really cannot praise enough the work by ‘Innovations in dementia‘. Innovations in Dementia has in the past been working through the Ageing Well programme with two areas, Hampshire and Sheffield, to support their work to create dementia friendly communities. As part of the work in Hampshire, they have produced a dementia friendly communities toolkit, which was designed to support work at a local level. The tools have even been used by the Alzheimer’s Society locally. But the Alzheimer’s Society has a massive business advantage nationally. Its ‘Dementia Friends’ programme has massive funding. The Alzheimer’s Society also has capable resources for its marketing. The Alzheimer’s Society has just appointed Lida to creating a series of campaigns that aim to increase the acquisition of new supporters and grow its mass participation events. But accreditation can be good for ‘competitive advantage’. The UK division of Hilton Worldwide has become the first hotel company to be awarded the Carbon Trust Standard after measuring and reducing its carbon footprint. The award requires organisations to measure, manage and reduce their carbon footprint and make reductions vear-on-year. Hilton believes the accreditation will give it a competitive advantage over rivals when the government’s Carbon Reduction Commitment league table begins next year. 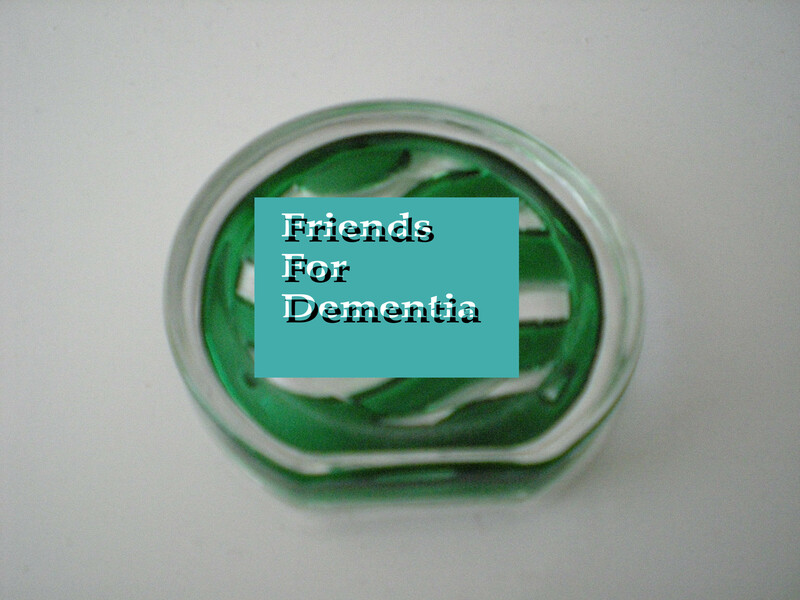 There’s no doubt in my mind that dementia ‘friendliness’, however delivered, is a wonderful societal aim. But it should not be a cover for cuts in social care or in the NHS. And also it’s widely established that ‘Dementia Friends’ cannot be used in place of training for those who need more than basics. I, too, will be doing my bit too though for raising awareness too. I’ll be doing a ‘Meet the author’ slot at the London Alzheimer’s Show. Please follow the Show on Twitter (@AlzheimersShow). I think also it’ll be possible to see my book, a book which is very ‘un-medical’ in its approach. It’s all about celebrating the individuality of a person, what he or she can do, and how the environment is so important for quality of life. It’s a different way of doing things. But that’s also raising awareness. I think the article is right to question what dementia symbols mean and what training dementia friends or organisations have undergone to get their accreditation and what their motivation is. A uniform approach is needed to secure the best outcomes for people with dementia so they expectations are the same for anywhere that displays a symbol. It is extremely important to consult People with dementia about what they want dementia friendly communities to look like. A community dementia friendly garden? or a service that is accessible in all ways to people living with dementia. We also have to recognise that Dementia comes in many many forms and so this consultation needs to be far reaching, involving many different service users, not just one person thinking what is best for others. Unfortunately because of the ignorance still surrounding Dementia and the diseases that cause it, there is still so much to do so that people can truly feel accepted into a community. Displaying a symbol on a window is just not enough. Agree totally with Jo a sign on a window is not enough but at least it is a start to enable discussion and create or generate further interest in a subject that has the possibility of affecting each and every one of us.